The plants photographed above represent a distribution extension of 350 km (220 miles) from the Stirling Range to 20 km east of Esperance. 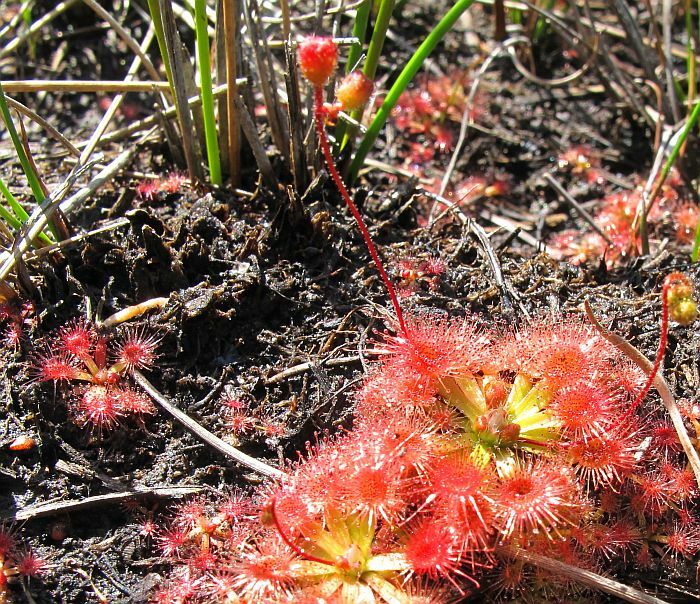 Here it is common but very localised in a sandy peat soil between two ephemeral swamps, one of which overflows to the other to produce a boggy zone between. 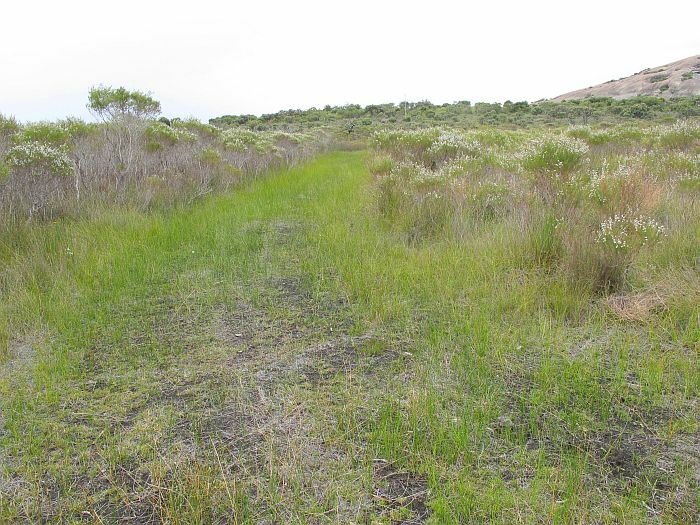 It is currently recorded from north of Perth, then mainly around coastal regions to the Stirling Range NE of Albany. 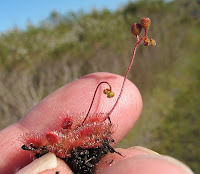 Interestingly, it occurs in the same location as the rare Utricularia westonii (see here), which requires partial inundation (to 10 cm or 4” depth). 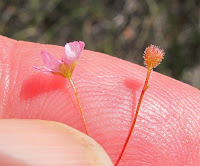 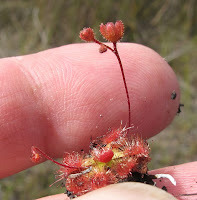 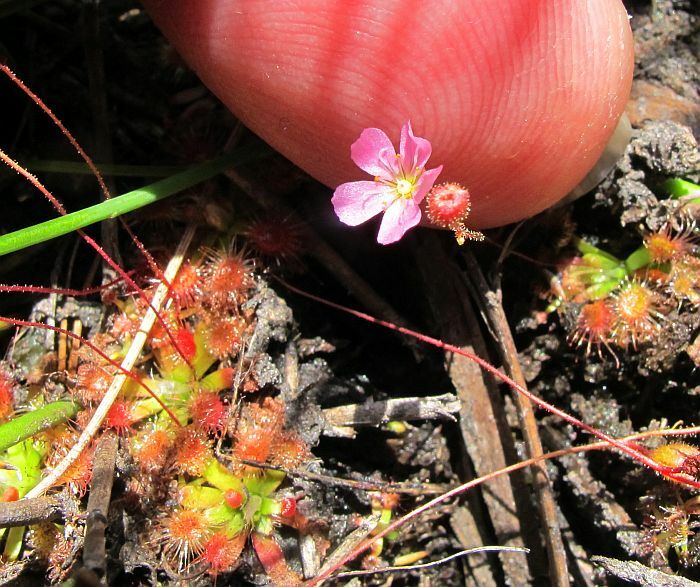 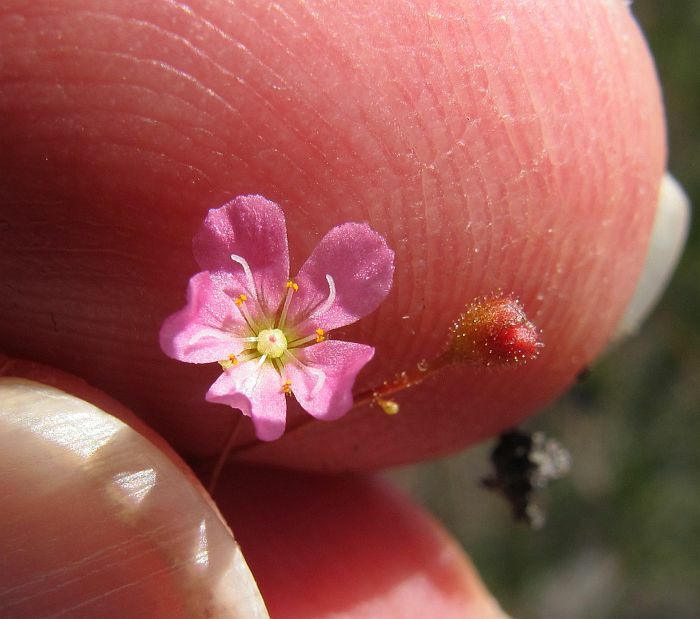 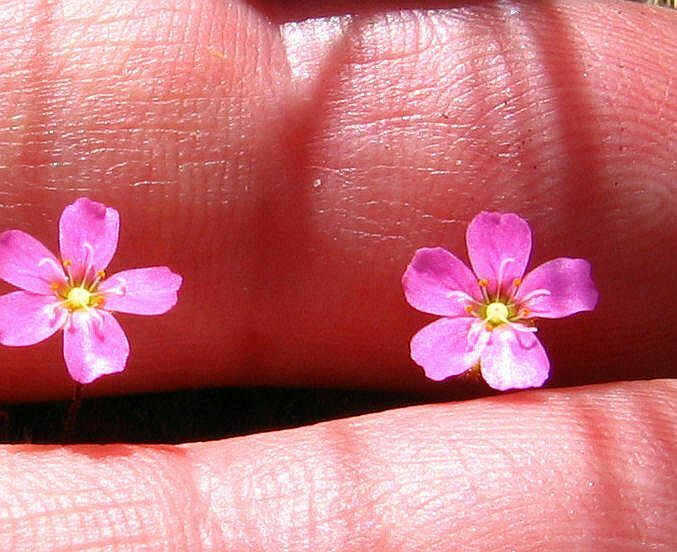 Drosera pulchella germinates when this surface water has passed to the lower swamp and/or evaporated (usually by October) to then grow and flower from November to January (providing a heatwave does not unexpectedly dry out the dark peaty soils). 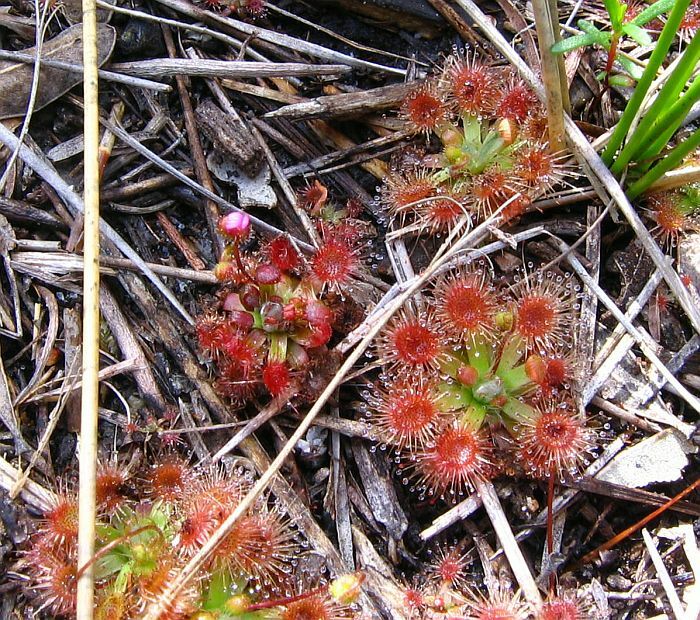 Locally, this sundew is an annual, probably due to the inundation, but elsewhere it can be a perennial if conditions are favourable. 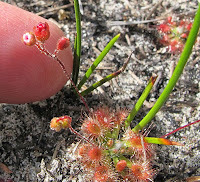 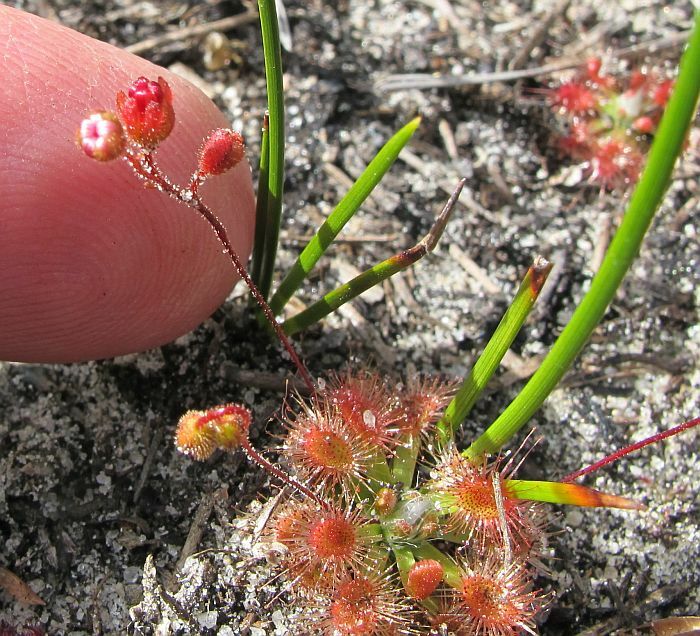 I have no doubt that Drosera pulchella would be quite common in the eastern Esperance region, as ephemeral swamps with seepage areas are common, but these small plants need frequent fires to reduce larger vegetation that would smother them. 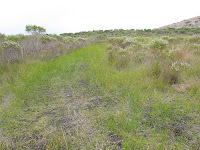 Above is a habitat photo showing a slashed track through the otherwise tall and dense swampy vegetation where the Drosera pulchella plants grow, I might add that Utricularia westonii also grows there for the same reason. 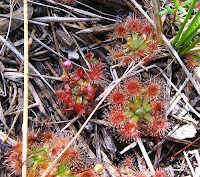 Drosera pulchella is easily distinguished from other sundews by the boggy habitat, plus their short, broad, flat petioles (leaf stalks), the 5 whip-like stigmas and locally 1-4 flowers (to 8 flowers recorded elsewhere) that are usually pink, but apparently can also be white or orange although not seen locally. 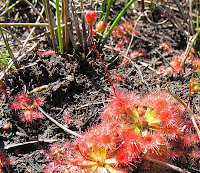 Drosera is the main genus of the Droseraceae family.